+ Q. How do I get emergency help? CALL 911 IMMEDIATELY FOR ALL MEDICAL, FIRE OR CRIME EMERGENCIES. The 911 Dispatcher will ensure you receive the right help. Be sure to stay on the phone with the 911 Dispatcher until all questions have been answered. Dispatchers work in teams -- while you are answering one Dispatcher's questions another Dispatcher is summoning help to avoid delay. Goodwill Fire Company or Queen Anne’s County (QAC) paramedics will respond within minutes for medical and fire emergencies. For crime, the Centreville Police Department will be dispatched to your home immediately. + Q. Where is the nearest emergency room? For lesser medical emergencies, go to the Emergency Center Queen Anne's at Nesbit Road just off Route 50/301 westbound (8.5 miles). + Q. What is the File of Life? The File of Life is a summary of your health that Queen Anne's County Emergency Personnel (Paramedics, EMTs, firemen) are trained to look for hanging from your refrigerator. Fill out this simple form, attach it to your refrigerator, and update it frequently (in pencil at least every 6 months) with your current information that can save valuable time and perhaps your life. Get the form by clicking here or seeing resident Eileen Rowley. It's easy. It's simple. It's free. Just do it while your health is good! - one for each occupant of the home. + Q. 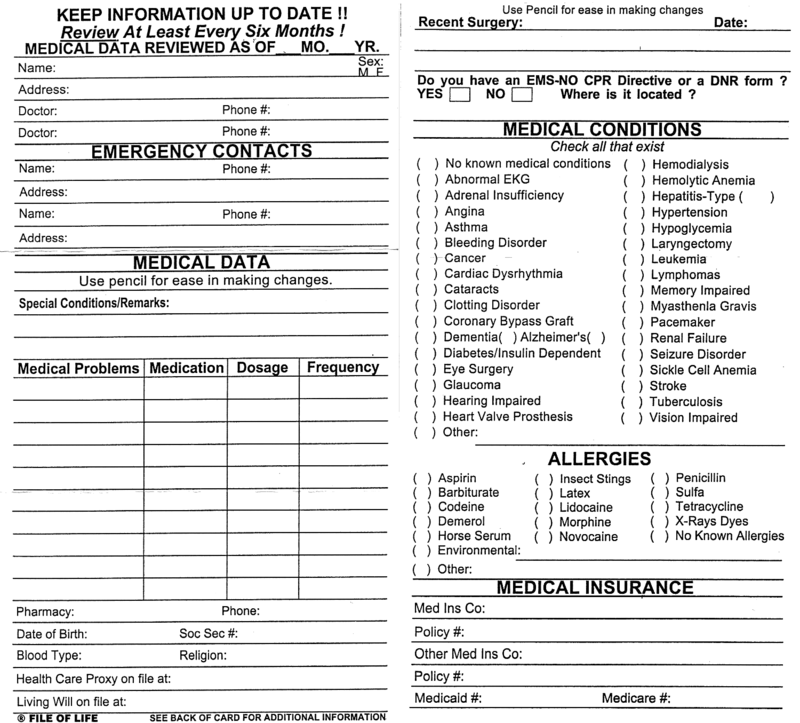 What is an Emergency information Form? To help first responders, CERT asks that you voluntarily complete this CONFIDENTIAL Emergency Information Form and return it to the SV Management Office. The form contains information about who the occupants of the house are, who has key access to the house, if anyone has any disabilities, and other information that might be useful to first responders in an emergency. + Q. Who do I call in case of fire? + Q. Do we have a Community Emergency Response Team? Yes, Symphony Village has a group of trained responders on their CERT team. Visit the CERT web page for information on dealing with household emergencies and preparedness. CERT also sponsors community informational meetings on various relevant topics. For more information, contact residents John Olson or Debi Wells. + Q. What are the Symphony Village Outreach Programs? The Symphony Village Outreach Program, Inc. is a non-profit 501(c)(3) organization created by the residents of Symphony Village, Centreville, Maryland, to provide volunteer services and financial support to charitable and civic organizations in Queen Anne’s County as well as to support fellow neighbors in the Village through the Neighbor to Neighbor program. Outreach is defined in the Terms of Reference as a non-Symphony Village Association activity and an Outreach report is given at board meetings. + Q. How do I get support in time of need? Neighbor – Neighbor is a Symphony Village volunteer program to meet the short-term needs of Symphony Village residents, whenever they require physical, emotional and/or spiritual support. Check the Neighbor-Neighbor web page which lists street captains that can help you with meals, rides, medical equipment and other support. + Q. What is Sneakers? Sneakers is a Symphony Village organization that supports Centreville schools through donations of both time and money. Sneakers has several fund raisers including the annual silent auction. Sneakers is defined in the Terms of Reference as a non-Symphony Village Association activity and a Sneakers report is given at board meetings. Sneaker is a 501(c) nonprofit organization and donations are tax deductible.